It's not too late! You can start a new pool at any time during the season! Make the baseball season more interesting by running a Home Run Pool. Our Home Run format is great for both casual and experienced players. Casual players can set their lineup at the start of the season, with no additional adjustments required, while experienced players can adjust active and reserve players each week. How does a Home Run Pool Work? 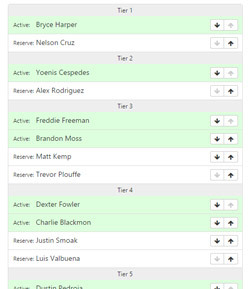 Each pool member chooses a roster of 16 MLB Players at the start of the season. 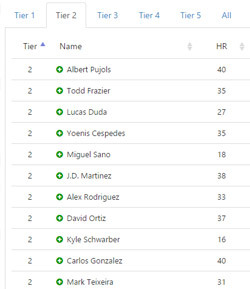 Only 8 of these players can be active at any given time, while 8 will remain in reserve. Members will earn 1 point for any active players who hit a home run. The person with the most points (i.e. most home runs) at the end of the season, wins. Add your company or organization logo to customize the look of your Home Run pool. For more information, see our Brand Your Pool page. 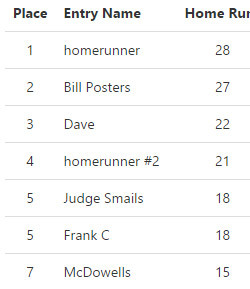 Every Home Run pool hosted at RunYourPool.com includes a free, private message board. Your pool's message board, accessible only to your pool members, is a great way to communicate with members. Run your pool with no payment or obligation through the first week of the MLB season. After the first week, there is a one-time fee to continue using the service based on the number of members in your pool. Our price is your one-time fee for the entire MLB season! Included in the cost is the added benefit that we retain your pool information and members from year-to-year. Simply reset your pool next year and have your members log back in to pick again. Start your MLB Home Run Pool with us today. If you have any additional questions, please contact us via email at sales@runyourpool.com. We're happy to answer any questions you may have.